Hi, Alice here. I’ve lived in Bindarra Creek forever. It used to be a small, quiet town…until the arrival of Dan Molyneaux. My life turned upside down the day he crashed near that damn tree, throwing me right out of my comfort zone and breaking down the walls I’d built around me. He roared into town in his high-powered V8—all citified—an investment broker who thought he could reopen the Riverside Pub and rip the band aid off my past. When I saw him on the side of the road—all tall, dark-haired, a feel-worthy arse and eyes the colour of rich hazelnut chocolate (imagine a combination of Hugh Jackman and Eric Bana)—I wanted to shoot him for being so damn nice and reawakening my heart. I was hoping some of our crazy locals would scare him off, like Old Man Jake and my grandad Charlie, but no, it seemed our new town hero was made of tougher stuff than to be freaked out by possums in the roof and teenagers decorating his walls in less than tasteful graffiti. Instead he embraced the town and its people, and slotted in as if he’d lived here for years. I wanted to hate him for it, needed him to leave before he stole my heart and made me forget what I’d spent eight years punishing myself for , but then he discovered my panic attacks and I uncovered his ghosts. Come and meet my hero, Dan Molyneaux, the man who pushed his own fears aside to lay my ghosts to rest, and made my heart beat again when I thought it had died on that terrible day eight years ago. Dan felt the tension rip through her body, her breath becoming uneven as she squeezed her eyes shut. Remembering the last anxiety attack, he diverted from his initial course from the veranda to under the big bluegum where Jake had left a couple of plastic chairs in the shade. He dropped her gently into a chair and knelt down in the dust, his hands anchored on her shoulders, eyes on her bent head. Park Ranger, Alice Pritchard lives with the ghosts of her past. Now, with rejuvenation of the town in the pipeline, she has no choice but to let go of the past. Dan Molyneaux roars into her life and reopens the Riverside Pub, forcing her to face her ghosts, his possum problem, Curly the cockatoo, Old Man Jake and Grandad Charlie who’s determined to find her the man he thinks she deserves. Alice would love to ignore them all and keep living in the cocoon she’s created for herself in sleepy Bindarra Creek, but fate has other plans for her. Dan isn’t looking for love or friendship. All he wants is peace and quiet away from the city highways. Soon he’s swept along by renovations, fundraisers, hell-raisers and the problems of a small town coming back to life. But it’s the park ranger he’s curious about. Why would a girl as beautiful as Alice bury herself in a backwater town so far off the main highway, it was merely a blip on the satellite map? What he uncovers raises some of his own ghosts from the dead. 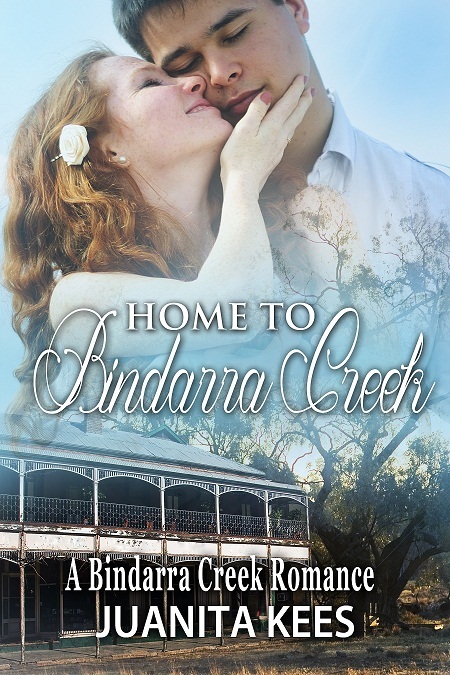 Alice Pritchard, heroine from Home to Bindarra Creek talks about her hero, Hump Day Hunk Dan Molyneaux. Would love for you to pop over and say hi. Thank you Louise 🙂 and thanks for the share on your blog. Love Alice and ready and Dan sounds just too yummy for words. Juanita – loved your extract and can’t wait to read it all!